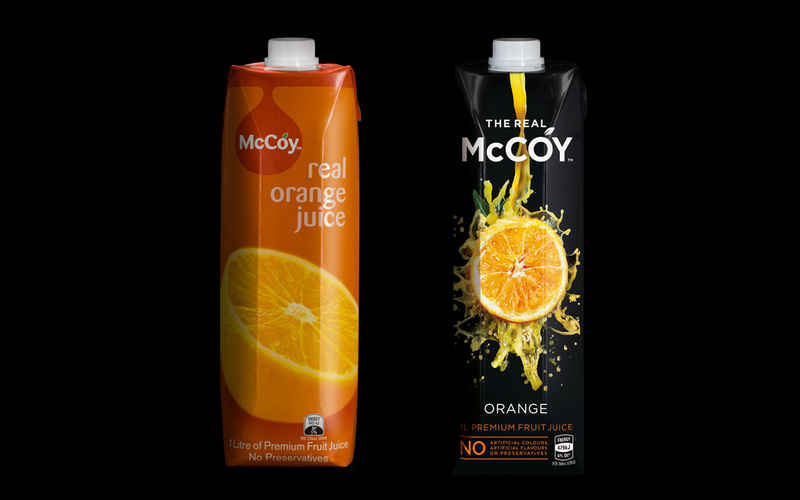 Frucor’s McCoy juice has launched a re-brand from Auckland’s Dow Design agency. When Frucor and Dow Design ran the ruler over the market and the existing McCoy pack, it seemed the foodie revolution had bypassed the juice aisle. The fruit juice aisle hadn’t evolved at the same rate that foods had and there was a need to bring exceptional design and premium appeal to the shelf. But according to Dow’s creative director, Donna McCort, “The category was becoming more confusing, which wasn’t helping McCoy. As the rest of the supermarket was going all Masterchef and MKR, the juice aisle lacked some of these authentic food cues. So we took the single fruit essence of the brand, and injected it with sophistication and craft. Hence the black background, the real, still life quality of the fruit and the natural splashing juice that although transformational, cues authenticity and remains true to the real McCoy”. “The packs don’t just look stunning, they have captured the true essence of the brand, The Real McCoy, but in a progressive way that reflects important food trends. That’s a very difficult branding task to pull off so distinctively for a product as established as McCoy. So we are absolutely delighted with the results,” says Joel Reichardt, senior brand manager for McCoy. Recipes have been introduced on the back of packs in the new design, giving consumers creative new ways to use their favourite McCoy product. The new McCoy packs are appearing on shelf this month.